The Cathedral and the Bazaar, Eric S. Raymond. The Alienware series apparently has a fairly common issue of panicking on shutdown (1, 2, 3, 4, 5). The apparent cause is something in the I2C Designware module. The solution used to be [disabling it], but things have changed since then, and now the Arch Linux kernel has it baked in instead of as a module that could be blacklisted. With some help from the Unix & Linux Stack Exchange, that problem has been overcome. The solution is to blacklist a kernel function, as Stephen Kitt suggested in February, and the correct function was identified by Yurij Mikhalevich right around the end of May. In the intervening months, I had my own hack around this: while trying to figure out when exactly the offending driver was loaded, noticed that shutting down worked fine if I booted directly to the systemd poweroff.target. So I added an additional EFI boot entry, which started the kernel with systemd.unit=poweroff.target, and then wrote a short script that enabled a one-time boot to that entry and restarted. So shutting down took a while longer, but worked fine as long as I called that script. So my monitor, a 24” BenQ, is visually below the 46” Sony TV. The monitor is smaller, but much closer than the TV, so reading is far easier on it. As a result, it is my primary display when using the PC. 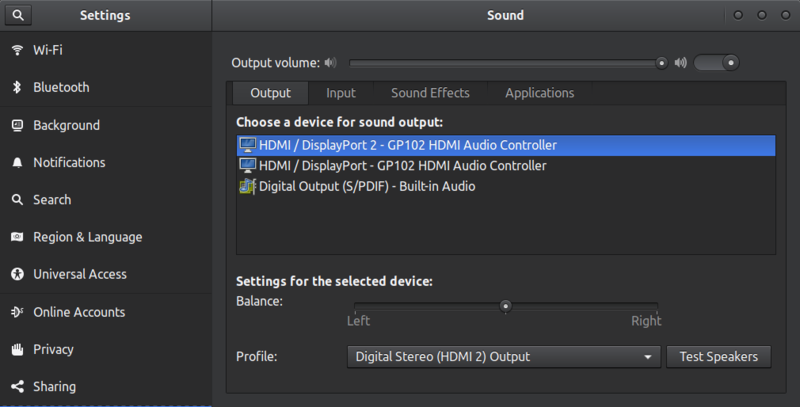 However, the speakers are connected to the TV’s audio out, since I also use the TV via a Chromecast, and in the past via an HDMI switch that connected it to my laptop. So it makes sense for whatever’s using the TV to have its audio go via the speakers. Quick: which would be the TV and which would be the monitor? Quick switching between display arrangements (GNOME Shell doesn’t have anything built-in for that, as far as I know). Ensuring that the TV is the sound source, no matter what the arrangement is. The tricky part, however, was PulseAudio. I find it confusing. There’s pactl and pacmd. There’s all those configuration files, default.pa and whatever else, written in a custom format, from what I can tell. Sinks, sources, ports, cards, …! ‘Tis enough to make one throw up their hands in despair! full set use the pacmd(1). A human-grokkable name (the product name) is available3 from PulseAudio! (Those are, in fact, what Windows shows!) Why TF doesn’t the sound settings use those? pacmd, ostensibly the more “powerful” command, doesn’t show the profile associated with each port. It’s probably hidden away in some other sub-command, and I’d need to parse out the port name matching the product name and then go hunting. Now all I need to do is wrap these up in scripts, have the display arrangement script set the sound output as well4, and use this neat extension to add a couple of icons to my panel, and bam! A click is all I need to switch profiles or fix sound if some bug caused the sound to go wandering around. I think, all said and done, a better way would have been to use PA configuration files to set a higher priority for the TV. But I can’t be arsed to learn the configuration language. So: ¯\_(ツ)_/¯ My scripts work and I postpone PA for a time when I have far more free time.